The Annual General Meeting of Old Rajans Scout Association successfully held on 17th November 2012 at Royal Mall, Kandy. Old Scout Mr. Lalith Heengama, former Secretary to the Ministry of Trade, Commerce and Food and Chairman of Environment Resources PLC graced the event as the Chief Guest while Mr. S.M.Keerthirathna, the Principal of the Dharmaraja College, Mr. A. P. Gunarathna and former Scouter at 1st Kandy Dharmaraja Scout group Mr. D.G.A. Perera also were present as Guests of Honor. Mr. Bandara Weeresekara, former Group Scout Leader and Mr. Sarath Matharaarachchi, Deputy Principal of Dharmaraja College and Asst. Chief Scout Commissioner were also present at the event. 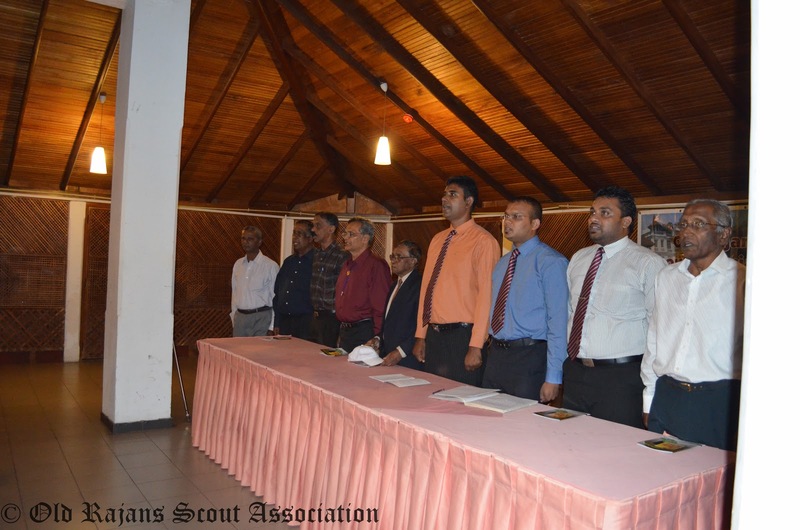 During the AGM, new office bearers for the year 2012/13 were elected. Specialty of the day was that almost all the elected office bearers were same individuals who were in the office last year as well. The meeting was proceeded with the member's get together and dinner. 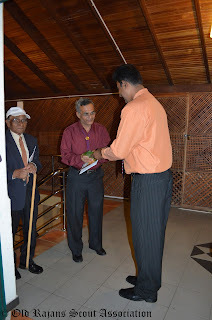 The annual report of the year 2011/12 was presented by the Secratary of the ORSA 2011/12 Mr. Chaminda Somathilaka. The ORSA felicitated Mr. Kithsiri Kulasooriya, Mr. Anura Siri Kumara, Mr. Madura Matharaarachchi and Mr.Leelanada Weerasinghe for their service to the association previously while they were at the office. Speaking at the event chief guest Mr.Heengama, reminded his days at Dharmaraja and his participation at the World Jamboree in 1957 held in UK. He also gifted Rs.500000.00 to RISGO 2013 fund. Mr.A.P.Gunarathna, Mr.Bandara Weerasekar, Mr.S.M. Keerthiratna also addressed the gathering and expressed the importance to RISGO 2013 and extended their support to the Event. Mr. D.G.A. Perera, who is probably the oldest living scouter at 1st Kandy Scout group pointed out the importance of scouting for modern day childhood and expressed his gratitude to organizers of the event.